Is there an explanation of the Thermal Runaway message? I had been using the printer a good bit over 24 hours on different prints. I have turned the printer off, will let it cool and re-try later. Below are the settings that I was using. BTW I am running the new beta firmware upgrade. I allowed the Snapmaker to cool for a few hours and I have just completed a print. All seems to be good again.Guess I was just to keen to keep printing projects. I will however keep an eye on it for the next week. HELP! Same issue! 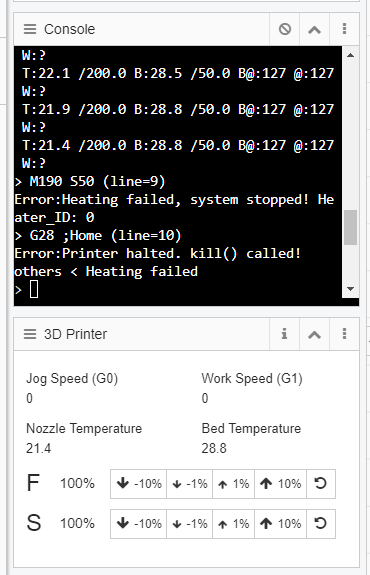 After a few minutes, my print bails with the thermal runaway message! Is your hotend (nozzle) hot or does it remain cool? If hot: is the sensor in place? If cool: replace heating element. We need more information to locate the problem. 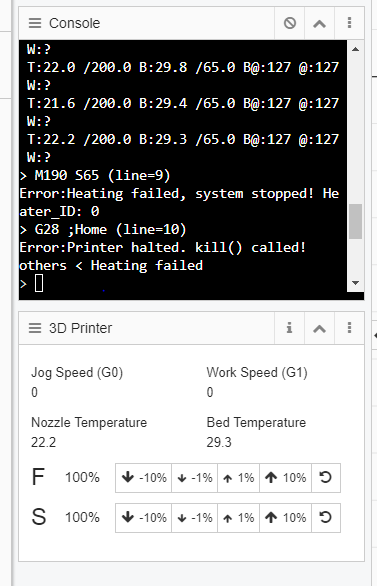 Can you get to know the nozzle temperature when the printer was killed. By the way, which software did you generate the G-code? nozzle temp gets up to 30. Sorry for the problem you ran into. If you have already filled in the warranty request, please wait for some time, we will process your request in 7 business days.